The new Mercedes-Benz C-Class Estate will be priced from £28,055 when it goes on sale - a £1200 premium over the saloon. The first cars will arrive here this September. Standard equipment includes roof rails and an electric tailgate. There will be five engine choices starting with the C200 petrol with 184PS available with a six-speed manual as standard or a seven-speed automatic as an option. 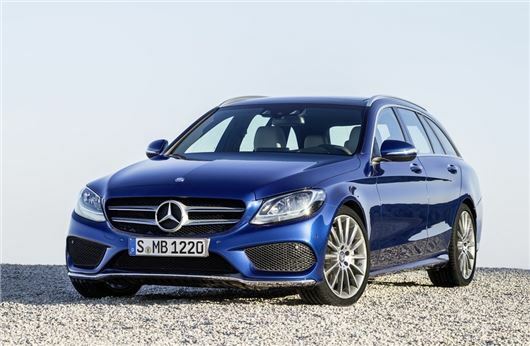 The mainstay are expected to be the C220 Bluetec and C250 Bluetec diesel engines with 170PS and 204PS respectively. The 220 Bluetec – available with a six-speed manual or seven-speed automatic gearbox - starts from £30,565 while the 250 Bluetec, available with a seven-speed automatic gearbox only, starts at £33,220. Two more engines, a C200 Bluetec and the C300 Bluetec Hybrid will be added to the range later in 2014. Three trim levels are available - SE, Sport and AMG Line. In addition there are several option packages starting with the Executive Package (£995 and available on the SE) which includes Garmin Map Pilot navigation system, heated front seats and chrome rather than black roof rails. The Premium Package adds a panoramic glass sunroof, Keyless-Go, the ambient lighting system and the electric seat memory package. The Premium Plus Package adds a Burmester surround sound system and Comand Online. The packages cost £1,595 and £2,795 respectively. Further options include the Driving Assistance Package (£1,495 available on the Sport and AMG Line models) which incorporates the Blind Spot Assist, Distronic Plus, Lane-Keeping Assist and the Pre-Safe anticipatory safety system.